Your water feature idea looks perfectly possible. You can buy a water feature reservoir or make one, you’d need a plastic container with a metal grill over the top to support the demijohn. Cover the grill with cobbles to disguise it. 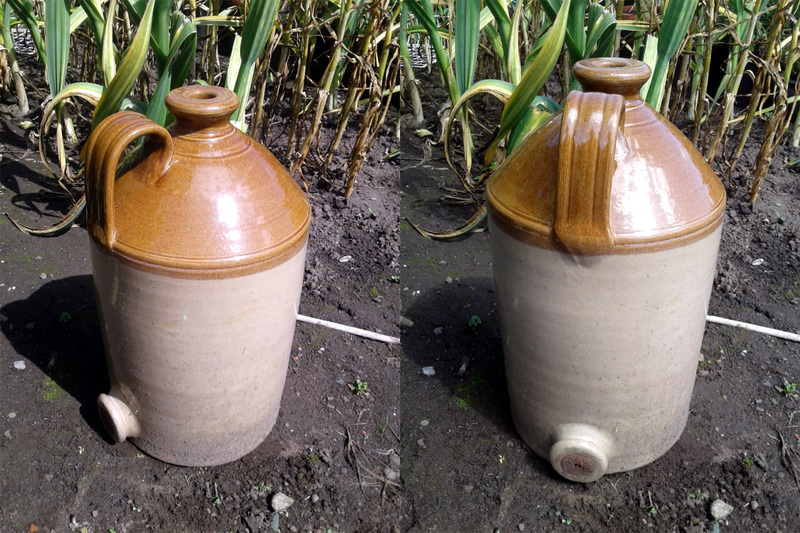 Pump goes in the container / reservoir and would be connected to the bottom spout of the demijohn by flexible pipe. There will be a way of connecting it and ensuring it is waterproof, just depends on the diameter of the spout. When the pump is turned on the water would fill the demijohn and then overflow back into the reservoir. Does that make sense? You know what, Jonathan, that’s an excellent point, and one I hadn’t thought of. I was assuming I’d need to run piping from the bottom hole up to the neck somehow, but it hadn’t occurred to me to use the whole demijohn as a water reservoir… thank you very much indeed!